ingaling! Terrific! Tantalizing! Isn’t this cute? Just stumbled upon this site via Eat Drink Chic and wanted to use the ‘T’ in something! There are 5×7 flat notecards and envelopes (perfect for thank you notes! 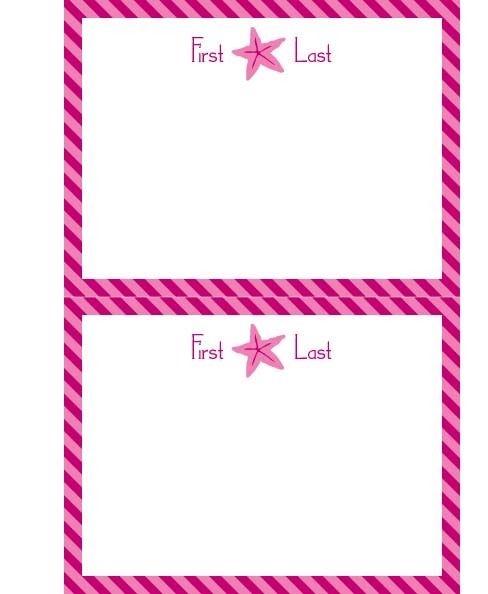 ), 2×3 enclosure cards with mini-lopes (perfect for accompanying gifts! and I love the mini-lopes), and a laminated luggage tag – all with the little girl of the day’s name. The little icon is a star fish – appropriate for summer, don’t you think? I will personalize 5×7 flats (with first and last name) for the first 10 (I think that is ambitious) people to comment on this post. Just leave me the first and last name as well as your email address and I’ll deliver the personalized PDF right to your mailbox in the next few days. Directions: You will need to print the PDF onto some letter size white card stock – then you will need to get envelopes to fit [at any office supply store – you will need size A7] or go to Michaels to get some pink ones (in their wedding section) to match! and I just use an Xacto knife to cut around the notecards – there is a thin white line to cut along to separate the 2 notecards. In the next couple weeks, I’ll be putting up a free bookplate printable for the boys, so don’t think I am forgetting about the little fellows.